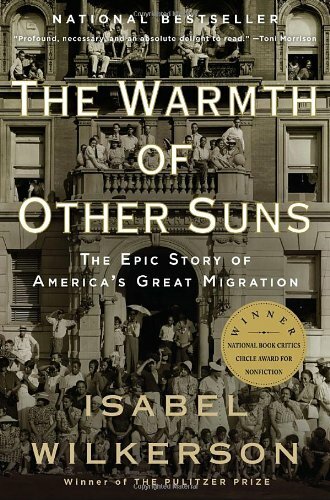 During segments of this week's reading of The Warmth of Other Suns, the author discussed shifts that occurred in the South with integration, for instance. However, as she noted, "change did not come without incident" (438). Of the difficulties the author discussed concerning changes or shifts in social relations, what was particularly notable to you? Why? As always, provide page citation. With my favorite character being Ida Mae, one of the shifts in social relations involves her husband's interactions with medical professionals before he passed away. George wouldn't take the medication prescribed to him because "to him that was just some kind of northern trickery and against his faith in God" (448). Even while in the hospital to be treated for sickness he would tell the nurses not to ask questions "just do something for me" (449). To me, this illustrates his distrust in people and I believe that this could have to do with the people he had been around while still in the South. Even though he was supposed to be moving to something "better," skepticism in people did not subside and that could have put possible strain on his social relationships. Many parts of this reading stood out me, however, there was one moment in particular that I had a strong opinion about. Pages 446-449 were focused on the aspect of modern medicine. Ida's husband was against it because of religious beliefs. I agree with him to a certain extent. Rather than being based on a religious view, mine is purely scientific and health related. He became hesitant with his interactions. I believe the medical community should not readily push drugs as to suggest that medication is the sole solution to health related issues. Simple precautionary measures like diet and exercise are overlooked and unnecessary drugs are being overly prescribed. His interactions with the doctors was completely understandable in the sense that the medication is not a necessary measure. The fact that the doctors are more concerned with the prescription than his wishes is just cause for a change in interaction. Something I think is very notable is the relationship between Robert Pershing Foster and his late wife's mother, Pearl, on pages 446-447. On page 447 Wilkerson states, "She never wanted to be part of the Great Migration or come out to California... was in LA only because her daughter's husband had been so insistent on fleeing the South..." I think that's pretty powerful because many Blacks were still cautious about abandoning the place that did them wrong. It was hard for the mothers to watch their children pack up and start anew and for some it was a battle to decide whether to go with their families or stay and risk never seeing one another again. I think we take that for granted how much distance really means to people, what with technology making it so easy to remain in contact with loved ones anywhere. I think the most notable social change was the integration of schools. After years of migrating there was still hatred toward blacks. As stated on page 437 "by 1970, 158 new white private schools had opened up in Mississippi. Whites would pay the high tuition and travel long distances just to attend these schools and get away from the black kids. I feel like this is notable because 1970 was not that much long ago, without the hard work and determination blacks put in to desegregate schools I probably wouldn't even be able to attend this school. On page 436, Wilkerson writes about the Brown vs. Board case, one that has always interested me. She stated, "The state funneled money to private academies for white students. But black students were left on their own...It would take more than fifteen years before most of the South conceded to the Brown ruling and then only under additional court orders" (Wilkerson pg 436). This is most notable to me because a lot of people take their education for granted, when back in these days, they wanted so badly to simply get the education that white people got. It really opens my eyes and makes me appreciate what seems like normal, small things (like having the privilege to go to school). Instead of dreading going to class and completing assignments, students should be thankful that they have an assignment to complete because it is one step to moving up. One change that seemed to greatly affect society as a whole was the intergration of the schools, desegregation of public places, and attempted progression away from discriminatory societal practices. As older generations passed away, the younger generations seemed to grow more willing to accept the changes that were occurring. One event that seemed to signify this change well was the removal of Sheriff McCall from the justice system." Then, too, a new generation of whites had entered the Florida electorate, the younger people who may have identified with the young freedom riders i Mississippi and Alabama..."(Wilkerson,440). This page also states that even the southern traditionalist had grown tired of his racist and overly brutal tactics and wished to have him out of office. To me this was symbolic of the slow but persistent changing times in dealings with the race issue. One of the notable social situations were the losses that many families experienced during their migration up north. On page 449, they talked about how Ida Mae's relatives had "succumbed to something- high blood pressure, diabetes... stroke, hysterectomies..." this was very notable for me because not only did families have to worry about start new lives in a place they were never familiar with, but they also have to deal with deaths and losses of the people closest to them. It just seems like a huge emotion burden on them to have to worry about their new lives as well as the old one they were leaving behind. I believe the most notable thing is the changes within the families that migrated north. By moving to a familiar place, they had to face new obstacles that were less common in the place the used to call home. The people around Ida slowly started to get, "high blood pressure, diabetes, which they called sugar, stroke,...,heart attacks,..." and dealing with the aftermath. For instance, because Ida's husband George ended up dying from a heart attack caused by the enlarged heart he refused to take medicine the doctors prescribed. Even though it would have helped, George's refusal for surgery or medicine and subsequent death hit Ida Mae hard. She blames herself for not being there for him, even though the medicine or surgery would have kept him alive longer. If George truly was religious he would have at some point heard, "Faith without works is dead." A notable social situation changes that I think really stuck out to me, was the affect of what discrimination is doing to now only the African american community in itself, but the school system. And how that has changed, due to new perspectives of generation. My mother has always taught me that, children are not born hating others, they are taught to hate others. When the old generation dies, the new generation start to be more open minded, this is seen on page 440. One of the more notable social situations were the deaths that many families experienced. Page 449 says that Ida Mae's relatives had "succumbed to something- high blood pressure, diabetes... stroke, hysterectomies..." They had come this far to be separated by death and illness. They were starting over with new lives in a new foreign city and they can't even have their loved ones by their side as they adjust to the new life and it gives them a more emotional burden to carry with them on top of everything else. The incident that caught my attention the most in this reading was on page 439. "Colored Only and White Only signs were coming down all over the South during the 1960s. But Sheriff McCall did not take down the Colored Waiting Room sign in his office until September 1971, only under threat of a federal court order." This quote shows an example of the TRUE reality of the US despite the "change" that should have occurred. The hateful actions of this sheriff (a respected person of authority!) keeping segregation signs ILLEGALLY shows that even laws abolishing certain actions cannot change the true natures of the people committing the actions. A change of laws does not necessarily correspond with a change of hearts. The end of page 436 talking on the Brown vs. The Board of Education case stood out to me, not only was whites unsatisfied, but some blacks were too all because they felt as if they passes the law just to show that the blacks who migrated there was more of a peacemaker than the blacks who have left. The most notable social change to me was the ruling to integrate schools discussed on pages 436 and 437. I found this section interesting because of the length of time that it took for it to happen after the ruling, and how whites did whatever they could to avoid sending their children to schools with blacks. It was court ordered end segregation in school in 1954, but efforts weren't made until about 16 years later after multiple rulings. It's crazy to think that this happened not to long ago. It was also interesting to read all the troubles that people went through to avoid sending their children to school with blacks. The author wrote that white families were sending their children to private schools in which they could barely afford the tuition, so stay-at-home mothers had to go back to work, the families had to give up their normal lifestyles and some even split up their families to help cover the cost. It just seems so crazy at this day to go through all that trouble for something like that. What was notable to me was how the south acted when the Brown law was made. Some of the schools just completely shut down instead of integrated. On page 436, it shows how some southern states felt, they would funnel money to private white academies for white students, but they would just leave the black students to fend for themselves. I found that, on page 436 and 437, the integration topic discussed was most notable. I learned about the law that integrated schools back in highschool, but this section truly made me think more about it. It's almost unfathomable to think that this change occured not too long ago. The stories on pages 445-449 were notable to me because they talked about two different view points toward modern medicine with the same out come. Alice died from cancer and even though her husband was a doctor he could not save her life. While George denied every chance to take medicine and eventually died. I really found the parallels of these two stories to be fascinating because it just proves how not in control people are of their lives and that what is meant to be will be. There are so many choices to choose from, but one that stood out to me (especially because it is also relevant in today's society) was on page 440. It reads, "This time, McCall was indicted for second-degree murder for allegedly kicking a black prisoner to death. The prisoner was in jail for a twenty-six dollar traffic ticket. McCall was acquitted." Instances like this have come up so many times in the past few years and it is painful we're been dealing with this discrimination for so many decades. Just because an alleged criminal (or in this case, a criminal convicted of an almost insignificant crime) does not give a person any reason to harm them. It seems like our court system cannot fully grasp that, but nevertheless, this really stood out to me. The most notable change was the school ruling in 1969 that did not take action until 1970-71 on page 437. The whites were willing to go back to work and spend all their savings and sell all of their luxuries just so their children did not have to attend a school with an African-American child. The education itself was not the most important part of school to them. The most notable part of this section for me was the death of Ida Mae's husband and how she brought up her mother's death as well. Her sister was getting surgery and she wanted to be there for support, but her husband was also sick. He told her to stay back, but she left and when she returned her husband was dead. ""I should have been there," Ida Mae said in one of her rare displays of regret. (449)"
Her husband refused the medication, because he did not believe the people in the north were really trying to help him. They treated them so badly that it made him deny things that might have really helped him. Life in the north was already bad for Ida Mae and the rest of the new migrants, but the death of loved ones made it even harder to see a future of happiness and change. All throughout this chapter, there were advances to rid of the segregation, prejudices, and racism paradigm. I would say the most notable in this chapter is when Jim Crow signs had to come down. After all of the advances made, there were still people like Willis McCall. This man tried to preserve the old traditions of the south to the point where he hung a sign in his home that would be illegal to hang elsewhere (440). For some reason, that made me think of today, how we still have that mindset. Just because there are laws that promote anti-racism and the world has pretty much evolved completely, there are still those who will never shift from that paradigm. These are the people that are forced to behave a way in society, but behave the exact opposite at home around their family and friends. This is part of the reason why I think racism still exists in younger generations. From pages 437-438, the author was saying how Florida began to join the free world and have blacks and whites learn together. But once a fight broke out between two boys of different races, the black assistant principle was in favor of the white boy, which was frowned upon by the black parents. This stood out to me because even though the system was trying to make blacks equal to whites, almost no one in society saw that as such and still began to discriminate and favor their own. And to this day, most still feel this way. The most notable shift in social relations was between Blacks and healthcare professionals. Reading about how Ida's husband died reminds me a lot of some people within the African-American community today. There is this stubbornness, even within my own family, that we have regarding our health and what should be done. Wanting to study medicine, I have noticed doctors hardly offer other options besides medication, but this is how they were trained, to get money to flow to pharmaceuticals. Both counterparts should reevaluate what is actually important. For the patient, it should be their health in initiating the visitation before they have to go. For doctors, it is treating the patient and also the illness. I found it the most notable what Robert was going through after Alice passed away. He started going to Vegas a lot more and its nice in a way because not long before he would have not been able to at all and now he was going once a week staying in the finest rooms of the finest hotels. He and his family had struggled for so long with finances and now he could afford to lose tens of thousands of dollars as talked about on page 453. He had grown somewhat of a fortune that was not often heard of in his early years being a young black man. I found the quote “The first sign of trouble was a fight at the newly integrated high school between a white boy and a black boy. It fell to the black assistant principal, who had been demoted from principal of a colored high school to an assistant at the reconstructed school to intervene.” On page 438. This stood out to me because it is a dynamic representation of the issues that arose with integration. The physical fighting shows the conflicts between the actual students. The assistant principal issue is a reflection of the bigger issue, a black male, was tried to make powerless even in a position of power. In terms of punishing the students the assistant principal was under heavy pressure. Even if he felt he was making the right decision, the community would view it as him choosing sides. I'd have to agree with Keanu. On page 439 where it states, Colored Only and White Only signs were coming down all over the South during the 1960s. But Sheriff McCall did not take down the Colored Waiting Room sign in his office until September 1971, only under threat of a federal court order.". I think it is absolutely ridiculous that Sheriff McCall was able to have that sign up nearly 11 years after signs were already coming down. That means that any African Americans who entered his office were still segregated against even though laws did not permit this. What was notable to me was the integration of schools on page 436. This stood out to me because even though the law was passed that said schools had to be integrated, it didn't immediately come into effect. I can't believe that people were so against integrating schools and now (depending on where you live) it's so common that people don't even think about it. This made me feel fortunate to be able to attend schools where I don't have to think about this. But, it also made me think of ways that we are still segregated today. On page 438 it talks about how McCall rode up to school with his dog to go after the black student who was "provoking a fight." Right after it gives examples of how he had been abusing his power and was taking matter into his own hands. In the movie "In the Time of the Butterflies," it showcases three woman who wanted a change in government fought and were brutally murder by men who abused their power. In the similar case McCall abused his power and tried to take matters into his own hands. These are perfect examples of difficulties with changes because some people will see that what they have is better than what is new and will do whatever they can to make sure that it stays that way even if the times are changing. What's interesting is the South's unwillingness to desegregate. Even after the passing of the Civil rights act, and so on, the south didn't act with deliberate speed. To the south their leaders were "moderate by southern standards" (Wilkerson 439). The south had transformed in comparison to what it use to be but in reality they were still segregated regardless of what the law said. Though the signs were remove, things were still highly segregated. The segregation was not just on the south, in reality, the entire country was segregated. Robert Foster is the person who most interested me because after he lost his wife he immediately started gambling and then became addicted to gambling(452). I just saw this obvious psychological shift from caring about money and his dream so much that he would travel through a desert while sleep deprived to not caring about it at all. He stopped carring because he just started blowing it all and gained so much that he didn't care. The only relationships with other people were the people that he took to record his winnings(453). The most notable shift in relations was on page 436 when the supreme court coined the segregation of schools unequal and it states that Prince Edward County closed in Virginia closed its entire school system for five years. This was very notable to me because for one, it was very petty and two it shows how whites had so much hatred in their hearts that they didn't even care about the well being of their own kind. They did not care about how the white kids whose parents may not have been able to afford private school lives would be affected all they cared about was trying to keep blacks down. What stuck out to me the most were Pershing's sections because out of the three he seemed to have lived life to the fullest. Him not being able to stay or visit las Vagas lead him to get addicted to it to some extent and it ran him ragged. Although, when he started working the at hospital again that was arguably the biggest shock he experienced. He was was still treated the same before he opened his private practice where he was the peak of his game. "it was as if he was hurled back fifty years to the Paramount Theater back in Monroe ... it seemed that Jim Crow would not die"(462) which really set the tone for this section. I became so bad at his workplace that he had to retire for his health which goes to show you that it really didn't matter what you did during Jim Crow you were still seen as the lesser. The description of Willis McCall's actions on pages 438-439 were the most notable, as it shows how much opposition was up against these changes in relations. McCall's unjust actions are just one example of how black bodies were abused in order for whites to take back the power they lost after the abolishing of slavery and the continual gain of black rights. On page 439 the author describes and incident when a black man, Walter Irvin, was imprisoned for 18 years for a crime that he did not commit. The police would never be on the side of a black person, whether they knew they committed the crime or not. This is a struggle that we still face today in our court system. Blacks almost could not avoid trouble no matter how hard they tried. One thing that stood out to me was on pages 445-449. These stories have different views of modern medicine but similar stories. Alice's husband was a doctor yet he was not able to save his wife from cancer, whereas Ida's husband was against the practices of modern medicine because of religious beliefs. Although these two had different beliefs, it just shows that no one really has control of their fate regardless of what they believe in. I think the most notable change is on page 437. The text states, "A 1968 survey found that eighty-three percent of whites said they preferred a system with no integration. And they acted on those preferences. By 1970, 158 new white private schools had opened up in Mississippi. By 1971 , a quarter of the white students were in private schools, the white families paying tuition many could scarcely afford. Mothers went back to work to help cover tuition." I think this change is most notable because so much was done just because whites didn't want integration to happen. They couldn't even really afford to send there kids to private schools, but they did it anyways just to isolate blacks. We have truly come a long way. A shift in the social relations that stood out to me in this section came from page 448-449 when George had to go to the hospital and told the nurse, "Don't ask so many question...Just do something for me and ask questions later." This stood out to me because he was not being very sociable even though most people aren't when in hospitals but how could he expect the nurse to do something for him if she does not know what is wrong with him. I think that is still a problem today. People always want something to be done right away but really there is a process to it. The integration of schools and other public events stood out most to me. Whites would pay multitudes of money to travel far away to attend a school that did not contain any black children p 437). This unwillingness to conform and try to create a civilized desegregated community would make it hard to feel comfortable in a new home.